HEIC Converter - Convert HEIF (.heic) Images to JPG for Android, Windows etc. After iOS 11 adopted new image format HEIF, also known as High Efficiency Image Format, we are seeing growing demand for HEIC converters since the new format may pose compatibility problems for Android, Windows, photos editing tools like Photoshop etc. Luckily, there are many HEIC to JPG converters claiming to be able to handle HEIC image conversion no sweat. However, hearing is not believing. We tested nearly all the HEIC image converters in order to offer you the pick of the litter. In this article, we'll pick out the best HEIC converter and go through how to convert HEIC to JPEG! Need A HEIC Converter for MacOS & Windows? MacX MediaTrans - the best HEIC converting software in the realm of speed, image quality, ease of use etc. 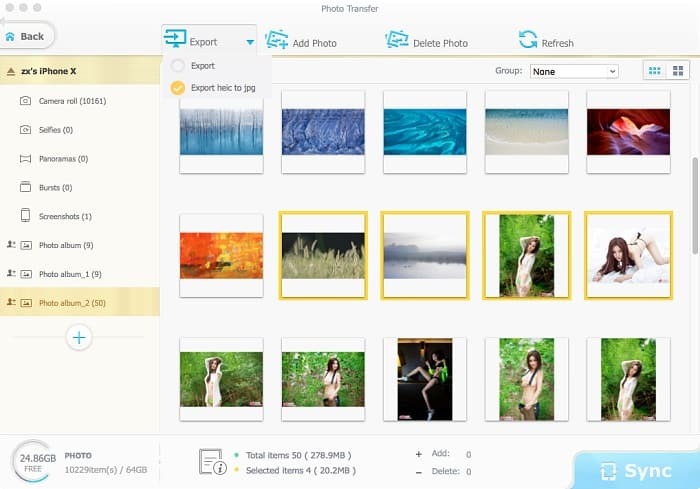 Preview, export, and convert HEIC photos freely. No file size limits, no plugin, no ads, 100% clean. HEIC vs JPG, the former is a much modern and efficient format. HEIF (.heic) based on HEVC video compression standard can extend the capacity of iPhone 7 (128GB) to store more than 100, 000 photos, so some users are eager to convert JPEG image format to HEIC. Smaller file size, better image quality, flexibility to contain a sequence of images, all the advantages of HEIF format show it's a promising image container format expected to conquer the image world. However, we have no idea how long it takes to push through HEIF format. Adobe Lightroom CC for iPhone and Lightroom CC for iPad starts to support importing HEIF (.heic) images, while tons of other image editing tools, Android devices, and Windows 10 currently don't accept HEIF photos. And we haven't seen HEIF format adoption on Facebook, Instagram, WhatsApp, and on and on. free HEIC image encoder or converter is needed before the whole system adds native support for HEIC. That's why users google " convert HEIC to JPG" from time to time. Slow HEIC photo conversion process can be a headache if you have thousands of HEIC images captured on your iPhone. An efficient HEIC to JPG converter will save a lot of time and energy. We tested some applications and some of the slow free online HEIC to JPG converter tools took several minutes to load photos and another a few minutes to convert 100 HEIC images to JPG or PNG format, while the fastest HEIC converter finished the task in merely 8 seconds. If a HEIC image converter doesn't have an optimized algorithm for HEIC (HEVC) transcoding, it's not surprising at all that output images get messed or damaged. We find some users complained that Dropbox converted JPG photos from HEIC were not viewable on Sierra with an error messaging saying "the file could not be opened, it may be damaged." Batch conversion. A good HEIC photo converter should have the ability to batch convert HEIC pictures. It's disgusting that we should transfer HEIC images one by one. However, many free online HEIC image converters only support to export up to 30 HEIC photos at a time. Size limitation. You should consider file size limit when you use a free HEIC image converter. File size limit is one of common tricks buried on online applications. Operating system. Though many software developers are backing an effort to support HEIC image format, the HEIF format imposes a new cost for them, and few HEIC image converter program is available for both Windows and macOS. MacX MediaTrans is the first free HEIC converter that supports macOS and Windows, including the latest macOS High Sierra and Windows 10. Free Online HEIC Converter or Desktop Applications? We can use either online HEIC converters or desktop software. Most popular free online HEIC to JPG converters include heictojpg and aconvert. We list advantages and disadvantages of using free online HEIC converting tools to help you make a better decision. While we can avoid ads, size limit, and risk of data leakage using a solid desktop HEIC photo converter. We tested nearly all the programs for HEIC image format conversion in terms of ease of use, speed, and quality. Now, you don't need to try them one by one, just select the tool we list below. Don't need to download software. Misleading download buttons, ads, malware. File size limits (30-60 photos). MacX MediaTrans gave perfect performance in our test. Look at its features below and understand this robust HEIC image converter better. Fast speed. Only 8 seconds are needed to convert about 100 HEIC images in 4K resolution. Support to convert iOS 11 HEIC photos to JPG format in batch or one by one. It's within your control. Open and view HEIF (.heic) photos on Mac (10.12 or earlier) and Windows, Android, Microsoft, or any photos editing app freely. Simplicity. Modern interface design makes it super easy to get hang of it. Drag-n-drop available as well. No file size limit. There is no limit on how many times and how many photos you can convert. Step 1: Launch the HEIC to JPG converter on your computer, and connect your iPhone to the computer with iDevice USB cable. Step 2: Click Photo Transfer on the main interface and you can see all the photos are displayed on the left side of the Photo Transfer window. Step 3: Select HEIC photos to convert. You can select one image or multiple photos at a time. Click the Export drop-down menu, and you should see two options on the drop-down menu, "Export" and "Export heic to jpg". Select "Export heic to jpg", then click Export button on the top, and the HEIC image converter will speedily convert HEIC to JPG image format without decreasing quality. The next time you convert HEIC photos to JPG, all you need to do is to click the Export button as the free HEIC image converter will remember the "Export heic to jpg" setting you've done before. The "Export" option allows you to directly export HEIC images from iPhone to Mac/PC without converting. 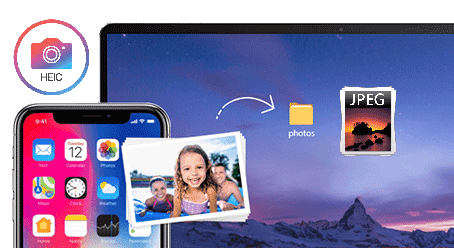 MacX MediaTrans can convert HEIF(.heic) images to JPG and transfer any photos in heic, jpg, bmp, tiff, etc from iPhone iPad to Mac/Windows with/without converting. Also support to delete photos, backup and transfer music, movies, videos, ringtones, books, and more.